Unfortunately, no-one said a word before Poulter played his next stroke and because he had played from a wrong place he incurred a penalty of two strokes (Rule 20-7), making three penalty strokes and a triple bogey score of 8 for the hole. He went on to survive the weekend cut by just one stroke and finished the event in a tie for 5th place; Two strokes better would have put him in a tie for 3rd place. Quite! There is no need for any further comment from me! For those of you that have only recently started following my blogs you may not be aware of my free, weekly ‘Rhodes Rules School’ series, which has now been running for well over four years. Click here to subscribe; it’s free, you can unsubscribe at any time and I do not share your contact details with anyone. Actually, what struck me about the incident was that Poulter proceeded with such confidence while taking the drops that it certainly appeared that he knew what he was doing. Tour pros have the luxury of a referee to help clarify any rules issues and to make a decision for them which the player cannot be held responsible for subsequently if it turns out the ref made the incorrect decision. I think this luxury has led to many players not bothering to refresh their knowledge of the rules, however Poulter was really daft not to use this luxury and consult a referee. Watching his actions, I’m convinced he was confident what he was doing was correct. Thanks for these comments. I certainly sympathise with amateur golfers who find many Rules of Golf confusing, but for a professional golfer not to take proper relief from an immovable obstruction is hard for me to fathom. As a rules official myself I can only hope that there were none present at this incident. If an official was present and allowed Poulter to follow improper procedure for such a fundamental rule he/she should lose their credentials. As for Poulter I think both he and caddie need to feast on that Rule Book. "If a player has deemed their ball unplayable, or is taking relief from a water hazard, they must drop their ball back into play under penalty of one stroke, unless they are playing under penalty of stroke and distance from the teeing ground, when they may tee their ball. A player must also drop a ball when taking relief, without penalty, from an immovable obstruction, an abnormal ground condition or in taking relief when their ball is embedded in its own pitch-mark in a closely mown area. In any of the examples in this paragraph it is not mandatory for players to mark the position of their ball before lifting it, although I recommended that they do so, especially if they intend taking full advantage of the area of relief, so as to clearly demonstrate to their fellow competitors or opponents that they have dropped within the permitted area." It is the non-mandatory aspect of marking the ball that I would like to get a definitive view on. I am inclined to agree with you but I have been pressed to prove it! A ball that is lifted under Rule 28 does not have to be marked. It is a short Rule, so I recommend that you ask your 'doubters' to read it through in full. It is a very common misunderstanding. Only balls that have to be replaced have to be marked (Rule 20-1). See my blog of 17th October 2012 for more detail. I am particularly interested in the procedure followed by Ian Poulter in connection with a similar procedure followed by Fleetwood in the same competition and same situation. About the fact of the wrong place it is all perfectly clear and it is not part of the question. 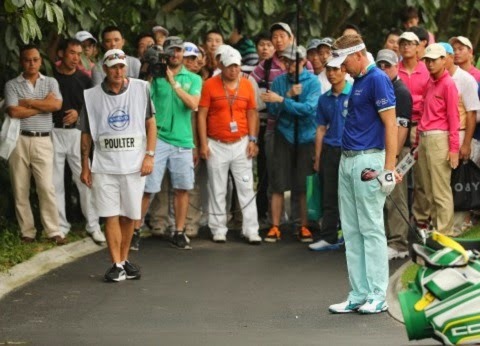 What it is puzzling me it is the fact that Ian Poulter did not put the ball in play on the road. He marked the point with a tee and he started with the relief procedure (after the procedure for 26-1). Fleetwood instead put the ball in play on the road and, meanwhile he was deciding the nearest point of relief, the ball moved and was (erroneously?) stopped by spectators. Is it possible, in your opinion, to invoke decision 20-3/3a to justify Ian Poulter procedure? My question is connected with the difficulty I have to understand exactly the meaning and the extent of that decision. First let me say that I cannot see that Decision 20-3a/3 has any relevance to the Poulter/Fleetwood drops in China. This Decision refers to a situation where a ball has been moved (e.g. by a spectator) and has to be replaced at the same spot. The player does not have to replace the ball before choosing to drop it under another Rule, e.g. if they deem it unplayable. "The two club-length measurement resulted in him dropping the ball on the cart path, an immovable obstruction. Now the ball was back in play, Poulter was entitled to take relief from the immovable obstruction and he decided to do so."